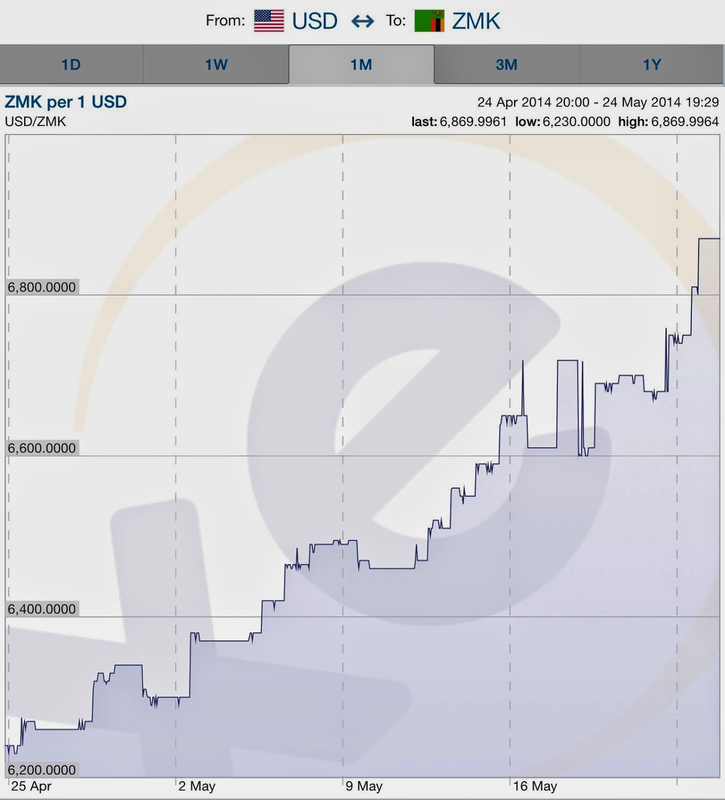 Zambian Economist: Saving the Kwacha : How should PF respond? Why? Because SI55 prevented politicians and big multinational organisations from taking money out of the country illegally and without prior authorisation. We predicted that the removal of SI 55 would result in worsening position because with the currency being vulnerable already, it will lead to even more leakage from our financial system. Except now no one knows where the money is going and by whom. Indeed without the procedures there is little incentive for some companies to even bring the money back to Zambia. The other factors of course contributing to the current economic challenges are well known. There large political risks associated with Zambia, increasing erosion of investor confidence, widening fiscal problems, rising external and domestic debt, poor global forecasts for copper, tapering of US credit, increased outflow of money made by construction companies (the revolving door phenomenon), rising demand for imports, and so forth. The list is endless. What is clear to members of the general public is that our friends in charge of policy are not doing enough to steer the country in the right direction. It is very clear what needs to be done. We need a combination of short and medium term solutions. First, we need to restore policy confidence by immediately firing Gondwe and Chikwanda. In any other country they would have stepped down and allowed people with fresh ideas to have a go at restoring policy and economic credibility. Without a change of personnel there cannot be any new changes. Secondly, we need to appoint a new BOZ governor under competition. The UK has a Canadian bank governor. The point is not that we should copy them. Rather we need to put national interests above petty politics. That means putting the job out for competition and let those who want to apply go for it. The President can then appoint from successful candidates. We need a competent man or woman in charge. Thirdly, take forward legislation that will guarantee operational independence of the central bank. This will immediately signal improved policy credibility. It does not require change in constitution. This should also be accompanied by a new Debt Management Bill that gives greater authority to parliament on domestic and external borrowing. Fourthly, the President should send a clear signal that the era of unsustainable borrowing and rising fiscal deficits has come to an end. This is really at the heart of our challenge. Many investors and ordinary Zambians do not believe PF understands the scale of the challenges facing the country. It is therefore important that a new "austerity programme" is instituted that focuses on identifying current public sector waste (e.g. close embassies, reduce size of cabinent, get rid of the new government bank for civil servants, cut CDF spending, halt plans for new stadiums, re-targe the roads and rail programmes, etc). No more new excessive spending until the current road and rail infrastructure programme is complete. Fifthly, prepare Zambians for the benefits of a weak but stable Kwacha. 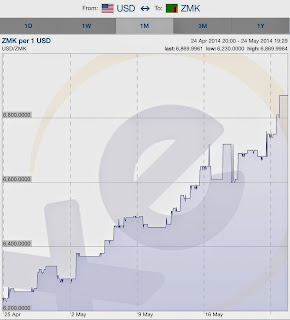 The problem is not the level of the Kwacha per se. There are significant competitive benefits to a weaker currency. The problem is stability. And politically the public has to understand why a weak but stable currency is potentially good for a developing country. This requires PF to accept that they were wrong to champion a strong Kwacha at all costs during the elections. They sold a lie and now they are being held hostage to it. Finally, we need a complete rethinking of our economic policy. The President needs to appoint a new independent economic commission that will come up with new policies to guide Zambia forward. Crucially such a body should be tasked with coming up with a clear policy on mining taxation that is fully consulted on with the public. In the long term the Economic Commission could be given wider remit on other areas e.g. industrialisation. Good leaders use difficult situations to remodel the country positively and not look to the past. The PF has a unique opportunity to use this crisis as a new opportunity to forge ahead. Not look to the past. Failing to act will just continue to leave the country on auto pilot. Sorry to see it is now 6.9. It is particularly disappointing to see this when copper is now back up to $6,900 and when at the announcements of the changes, including SI 55 abolition, the price was $6,500. This suggests very clearly, as the blog does, that the problems are internal factors not external factors. Confidence has not been restored so the currency will continue to slide.